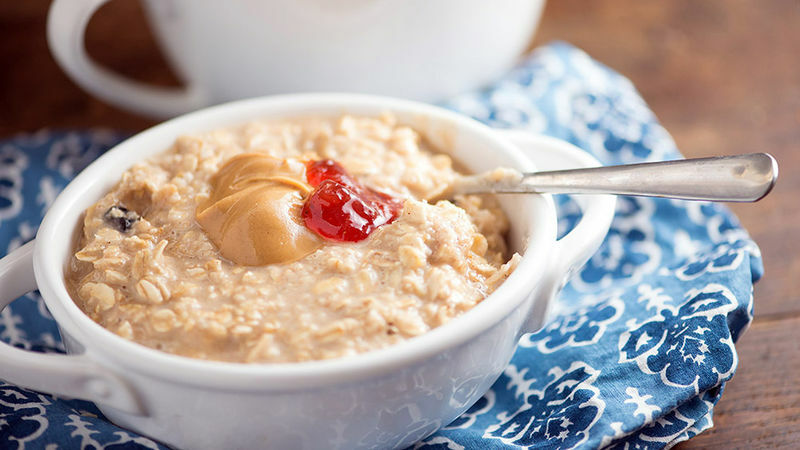 Stir the peanut butter, milk, and jelly into the warm oatmeal until creamy and combined. THIS is the way to start colder days. It’s starting to get cold outside in the morning, and I keep going back and forth between loving it and hating it. On the one hand—fuzzy sweaters! On the other hand—my hands are freezing. I just can’t make up my mind about how I feel about fall this year. I’m most definitely ready for the onslaught of pumpkin recipes, though! In the meantime, I’m warming up my mornings with a bowl of on-the-go oatmeal. Have you tried the Nature Valley™ Protein Oatmeal cups? They’re perfect for a busy morning. Especially if you take an extra 10 seconds and doctor it up with peanut butter and jelly! Prepare your oatmeal according to the package directions. This legit takes less than one minute. Add a bit of peanut butter, jelly, and milk. Stir it together and bam—you’re done.